A member of the Hibiscus family, rose of sharon is generally a low maintenance and reliable deciduous shrub for the landscape. However, sometimes, as gardeners, the things we do to try to help our plants can actually harm them. For example, rose of sharon shrubs can be very sensitive to over-fertilizing. Continue reading to learn how to fertilize an althea shrub. Also known as shrub althea, rose of sharon is a deciduous shrub for U.S. hardiness zones 5-8. Native to India and China, these shrubs are much loved for their prolific late season blooms. In late summer to fall, when most of the landscape is fading, rose of sharon shrubs put on a beautiful display of tropical looking blooms. When your shrub suddenly stops producing its usual plethora of blooms, you may try fertilizing rose of sharon to make it bloom better. 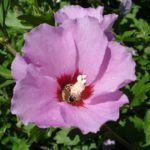 Although rose of sharon shrubs are not usually heavy feeders and can thrive in poor, infertile soils, slower or stunted overall growth and smaller or fewer blooms can indicate that your rose of sharon may need to be fertilized. That being said, when feeding rose of sharon plants, it is very important to not over fertilize, as this can cause more damage to the plant than not ever fertilizing it to begin with. The first time a rose of sharon shrub should be fertilized in when you initially plant it. You can simply mix in nutrient-rich organic matter into the planting hole, as a low dose natural fertilizer, or you can use a root stimulating fertilizer. At planting, it is important to avoid any fertilizer with high nitrogen levels, as this can lead to a quick flush of foliage instead of the proper root development that is necessary in a plant’s first season. Thereafter, rose of sharon shrubs can be fertilized each spring with a general purpose fertilizer for flowering plants. Using a slow-release fertilizer can take the guesswork out of how much to feed althea. Slow-release fertilizers also reduce the risk of over fertilizing. Always follow the instructions on fertilizer labels. If you prefer to use other fertilizer, select a 10-10-10 fertilizer for flowering plants. How much to feed althea will depend on the shrub’s size. Measure the shrub from the soil level up to the tips of its branches, then use 1 tablespoon of fertilizer for each foot of height of the shrub. When fertilizing rose of sharon or any plant, it is important not to apply any on the stems or trunk. For best results, fertilizer should be applied at the plant’s drip line. Fertilizer can be reapplied in midsummer, but keep in mind that rose of sharon can be damaged by too much fertilizer. Signs of over-fertilization are browning or yellowing of foliage, withering or drying out of plants, and fewer or smaller rose of sharon blooms.